Well, I am doing my best to catch up, but I suspect it will take me a few days, especially because tomorrow we need to prepare for an open house at the woodshop on Saturday, when anyone who wants to can visit us at work and meet us and see what we have been doing. So I will be adding groups of photos from the past few days as I can; these may be interspersed with more-current photos, so posts may be jumping back and forth chronologically until I do get caught up. Please be patient and try to keep it all straight. These past few days have been jam-packed, but I’m too tired to do a full post, so here is a brief summary. You’ll have to wait for photos. We nearly lost another resident to the emergency room. Saturday evening, Jean-François narrowly survived a vicious attack from a member of his own clan. 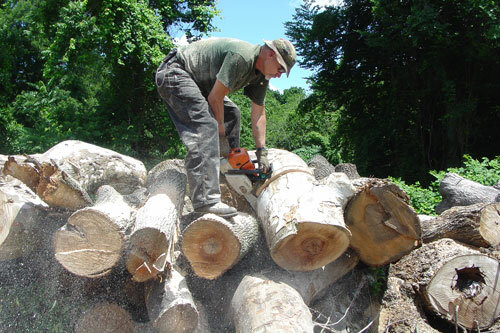 He was chainsawing an elm log (his last name, Delorme, means “of the elm” in French), and it split and fell on his foot and broke his left big toe. Peter escorted him to the emergency room, and Jean-François managed to limp out on crutches at around 3 a.m. He stayed behind Sunday on our trip to Mark Sfirri’s and David Ellsworth’s but recovered enough to come with us Monday to Wilmington, where he got to tour Winterthur in a wheelchair in chauffered comfort. He will have his revenge on the elm, though: he will turn a bowl from the log that attacked him. Our visits to Mark’s and David’s studios were fun. As I noted in my brief last post, Elisabeth accompanied us. 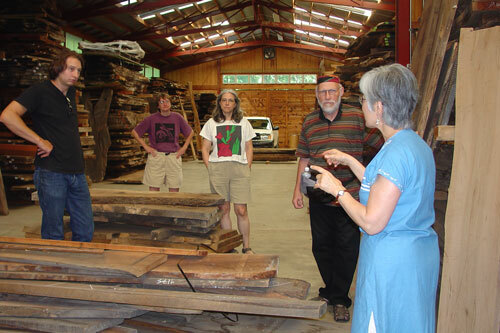 She enjoyed having the chance to talk directly with two eminent woodturners (unlike us ITErs) about their work, and we enjoyed seeing their studios, their work (past and present), and the work they have acquired from other turners, and talking with them, of course. We also enjoyed getting to know Elisabeth. Sunday evening was our first chance to meet Lesya, who seems eager to explore this opportunity with us. 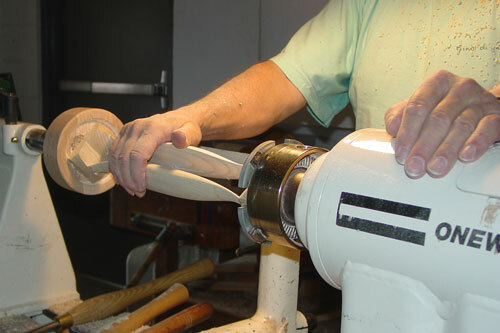 She couldn’t accompany all the rest of us to dinner with Albert and Tina that night, but she made it back Tuesday to learn more about our work and to take a turn at the lathe, where she quickly advanced to trying to turn beads and coves. 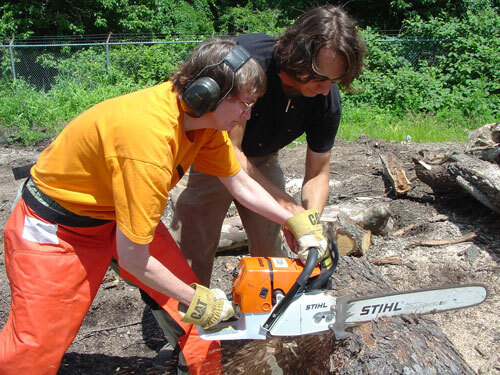 Elisabeth also tried her hand at turning on Tuesday and proved a ready student, though she admits it is “harder than [she] thought.” We didn’t make it easy for her: no round stock for her, but a still-rough log. She toughed it out, though, till it began to feel comfortable. But I’m skipping Monday, a long day full of pleasures. We began by visiting Winterthur, accompanied by Charles Hummel, curator emeritus and gentleman extraordinaire. There we got to visit the restored woodshop of the Dominys, a three-generation woodworking family from East Hampton, NY, whose shop dates back to the 1700s. (The shell has been recreated, but the contents are original.) Unlike other visitors to the museum, we were able to enter the shop and see up close the tools and equipment the Dominys used, including a pole lathe and a great wheel lathe. We even got to hold some of the hand tools. And we got to see their clock-making shop as well, which contained two other lathes, one not even six inches long, contained in a box (photos will come!). Get your hands on Charles Hummel’s book With Hammer in Hand: The Dominy Craftsmen of East Hampton, New York to see some of what we experienced. We also got a quick view of Gord Peteran’s exhibition there and managed to see some of the Winterthur period rooms. 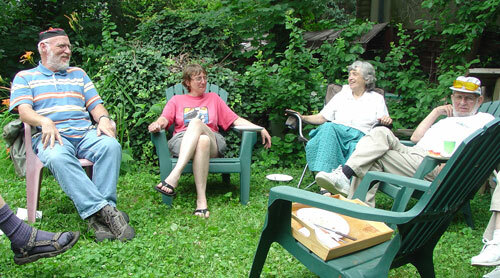 After a pleasant lunch with Charlie, we paid a delightful visit to the home of collectors Neil and Susan Kaye. Again, pictures will come. In the meantime, let me just say again how unique each collection is, how each reflects the personalities of the collectors, and what a pleasure it is to witness the joy people take in living in such beauty. The Kayes have many, many wonderful pieces and entertaining stories. We then were treated to the eyepopping collection of Bruce and Marina Kaiser. What a profusion of art their home contains! To do their collection justice, I will have to borrow some photographs from my fellow residents, as I had very little battery power left after Winterthur and the Kayes. There are pictures, however; have no fear. Bruce (Marina was out of town) then generously took us all (Albert and Tina and Charles Hummel rounded out our party) out to dinner. Yesterday, we had a long day back in the shop. Elisabeth and Lesya both got turning lessons, Elisabeth from Siegfried first, and both of them from me later (with good advice from Jean-François). Elisabeth got to know everyone a little more. Lesya began working with a couple of our pieces to develop dance works: Sean’s “mascot” sculpture (for which I need to write down the proper title) and my multiaxis cherry bowl, so far. Jean-François, who is unable to stand for long periods and so not yet able to turn, experimented with new finishes involving sand and gesso and other various coatings. 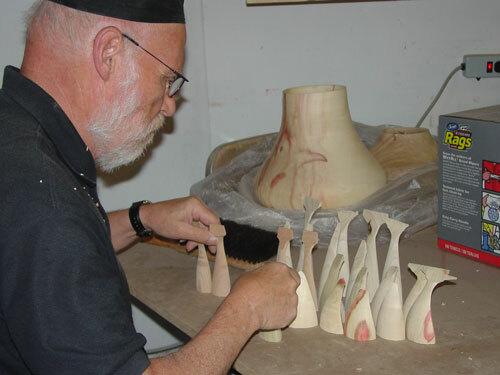 Siegfried got the vacuum chuck up and running with a foot switch he had his wife send him from home, and he worked on finishing the large vessels he turned first. 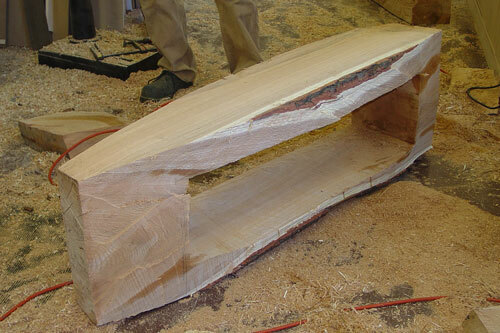 Sean continued to carve various pieces. 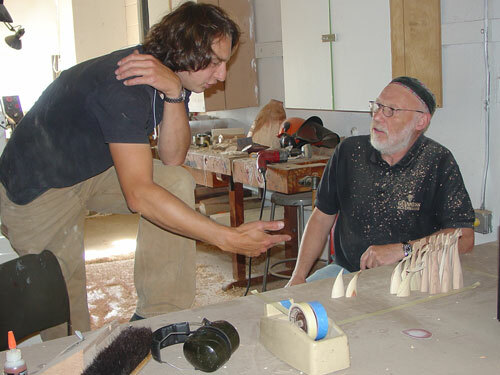 Peter worked on building a form for a collaborative piece with Siegfried. 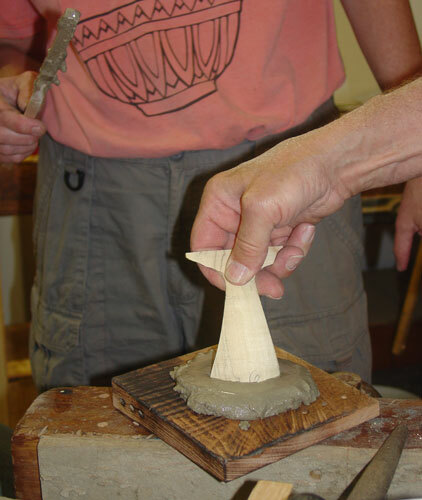 He also helped Jane develop and pour a form for a table she is making (we get everyone working here). I worked on a new honey locust bowl with a textured exterior and helped Jane a little (mostly as supervisor) with her table. 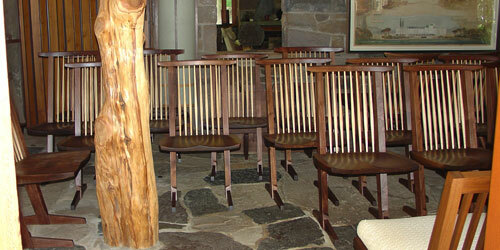 Today, we are off to the Wharton Esherick Museum with a stop afterward at the studio of furniture maker Brad Smith. Perhaps by tomorrow I can have some pictures for you to look at. A brief note . . .
to say catch up with us tomorrow. 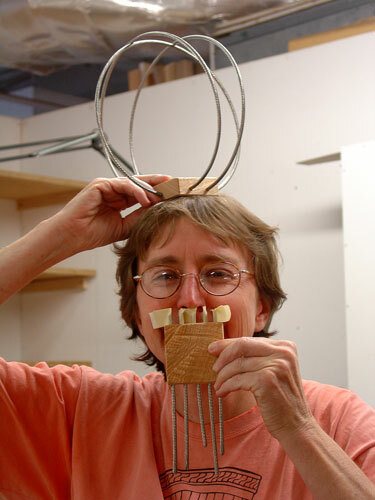 Yesterday, Elisabeth Agro, our resident scholar, joined us in a visit to the studios of Mark Sfirri and David Ellsworth. Upon our return, we all met with Albert and Tina, as well as with Lesya Popil, our dancer, to let Elisabeth and Lesya begin to get acquainted with the work we all have been doing. Today, we head to Wilmington, DE, to visit the Winterthur Museum, and then the homes of collectors Neil and Susan Kaye and Bruce and Marina Kaiser. Stay tuned . 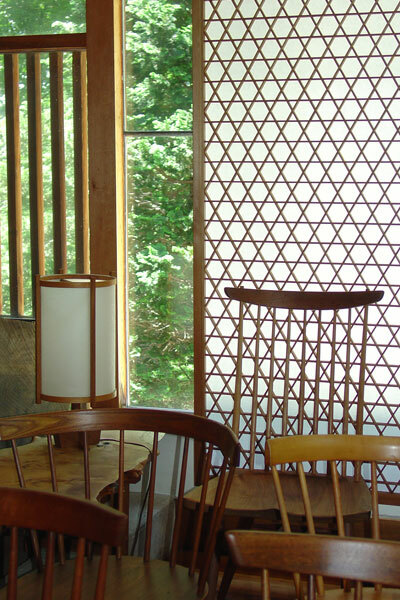 . .
Today, we visited the studio of famed furniture maker George Nakashima in New Hope, PA, where his daughter, Mira, continues to make furniture in the same tradition. Mira began our tour by telling us about her father’s life and work. 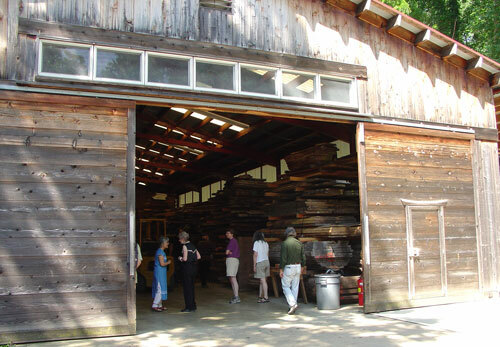 The first building we visited was the wood barn, filled with enormous slabs of wood cut from whole trees and stacked together for drying in the sequence in which they were cut from the log. 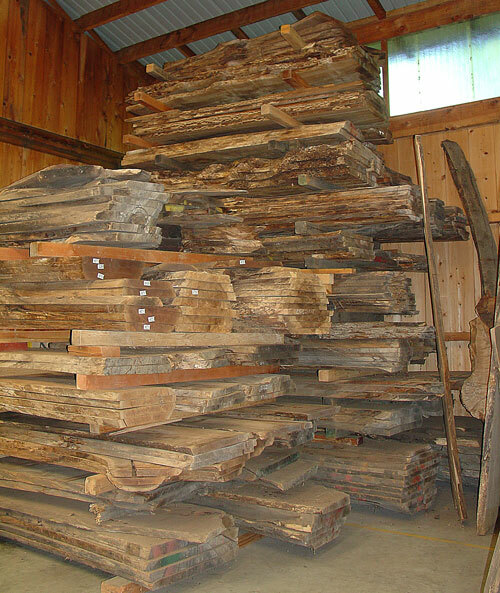 Mira explained the challenges of storing, keeping track of, and accessing the wood, much of which is stored for many years. 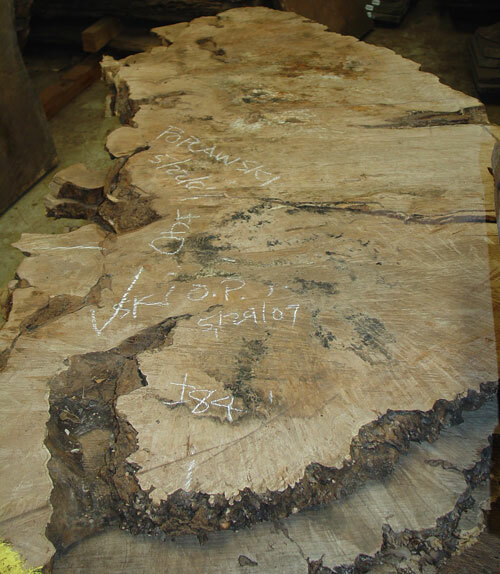 Many slabs were marked in chalk with customer names, measurements, cut lines, and other information. 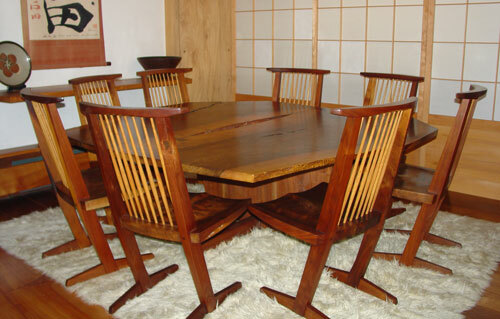 This dining set was in a residence built by Nakashima in the early 1970s. 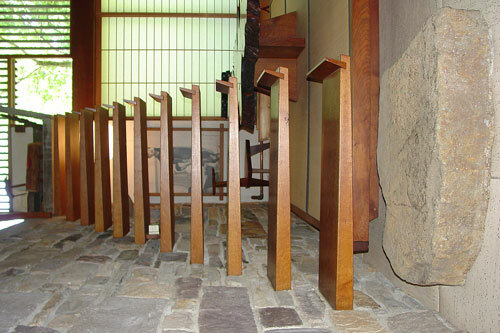 What is known as the art building is also the home of the Nakashima Foundation for Peace. The silver appearance of the table edges in this photograph is caused by the camera flash. 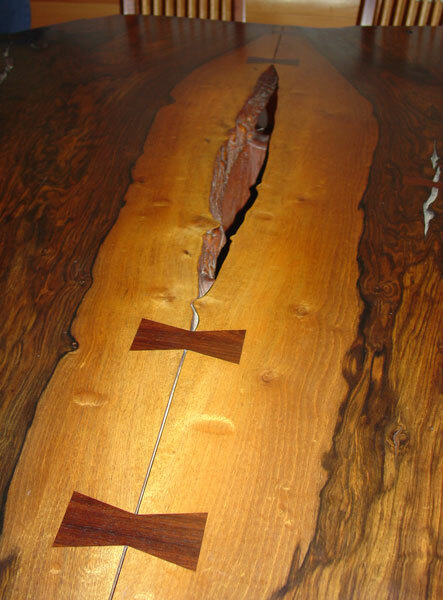 The edges are actually the dark, barkless natural surface of the trunk. 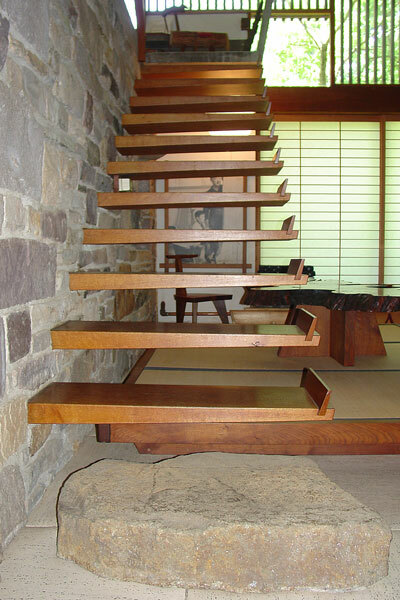 Notice how the concrete wall at the top of the stairs follows the same line as the right edge of the stairs. I liked the way the stairs looked viewed sideways just as well. The loft in the art building held samples of many types of chairs. 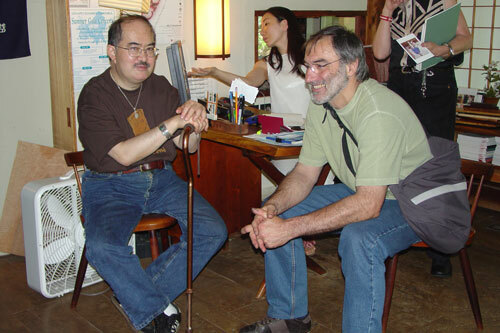 Jean-François enjoyed speaking French with Kevin Nakashima, who learned it in high school from a native French speaker. 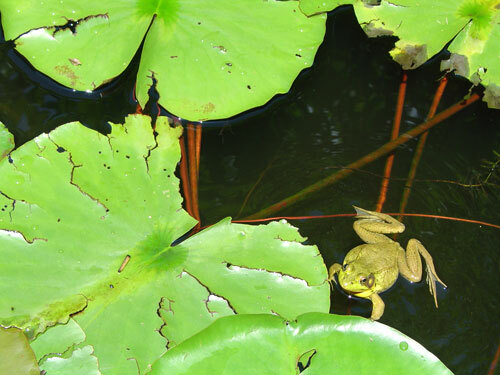 The pond outside the showroom had very vocal frogs among the water lilies. I thought their croaking was some sort of squawk from a walkie-talkie until I squatted down and looked. When I chose . . .
this image to represent my focus for the ITE, I didn’t realize that part of the ITE for me would be about mending brokenness and learning again to value the self that broke. The atmosphere in the shop is very playful. Everyone is engaged in a fresh way. Sean’s work is as unpredictable as ever. 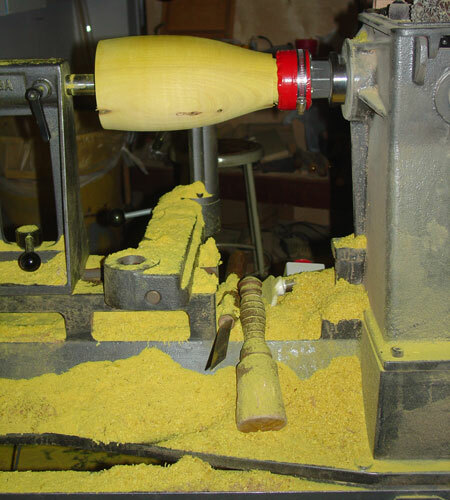 This morning he had cut beads into the exterior of the osage orange piece on the lathe. 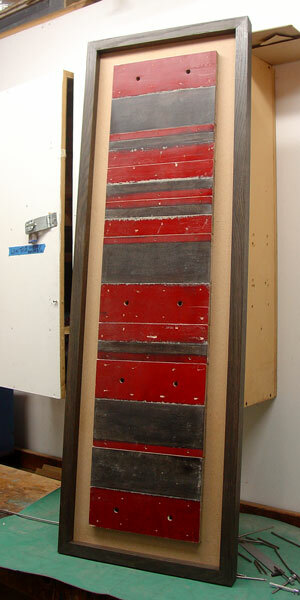 Later, this is how the piece had developed: Sean colored the interior bright scarlet. 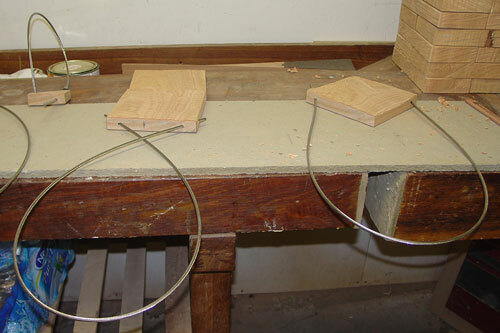 Then he cut the beads nearly apart on the bandsaw and inserted ebony wedges to open up and bend the form. Stay tuned: this piece is still evolving. 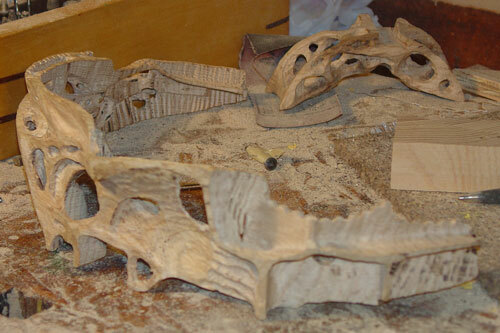 This is how far he has come on the first piece he started, the oak ring sculpture. Here, he is holding in position three of the carved pieces. A fourth is not shown. 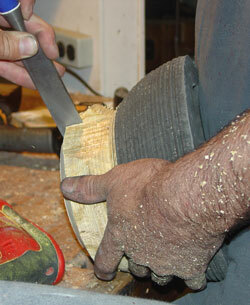 Siegfried has turned some deep bowls of box elder in addition to the wave forms he continues work on. I don’t know, but judging from their shapes, I suspect that these bowls may be intended for a collaboration with Jean-François. 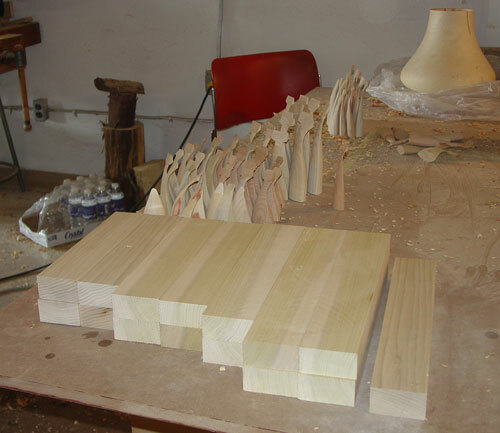 Peter helped Siegfried out by cutting a stack of poplar for Siegfried to turn into waves. 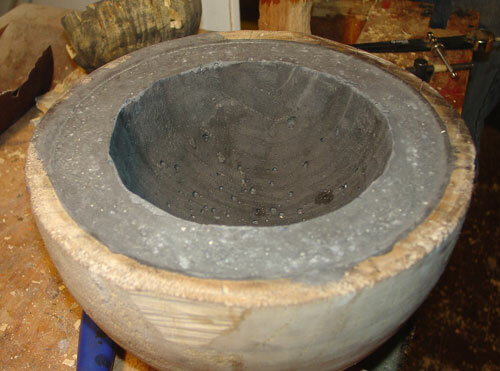 Jean-François turned another form for a new cement vessel. 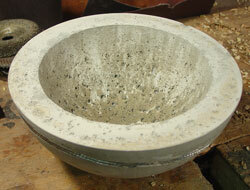 He has textured the interior (for the exterior of the cement bowl) with an Arbortech. 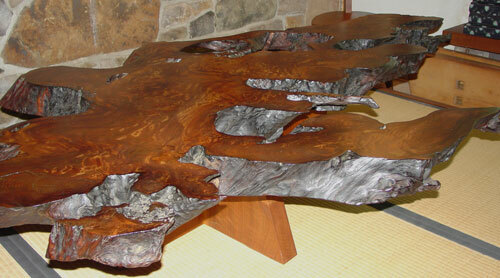 He also continues with his oak bowl series. Here, he is parting off the second bowl. Peter manages to get some of his own work done despite spending most of his days helping everyone else. 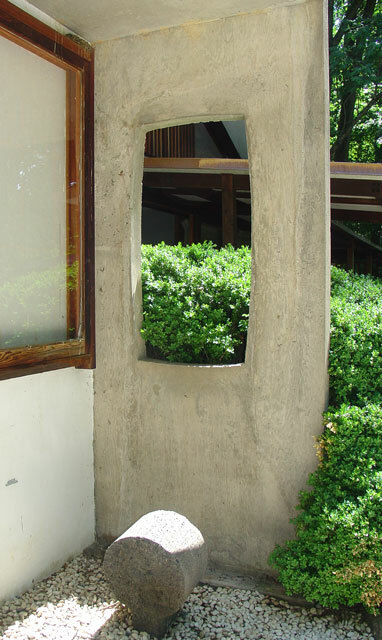 Here is his first wall piece, made from used concrete forms. The oak frame was colored using Jean-François’s vinegar-and-steel-wool technique. 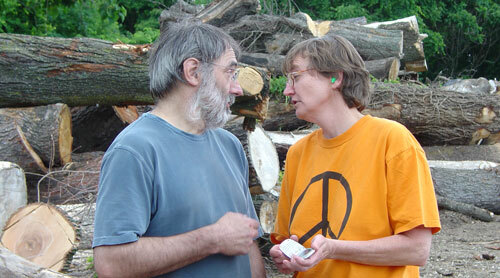 While Peter was busy helping others, Jane tried on a few of his honey-locust-and-cable pieces for size. I’m not sure Peter has realized that his work is wearable. 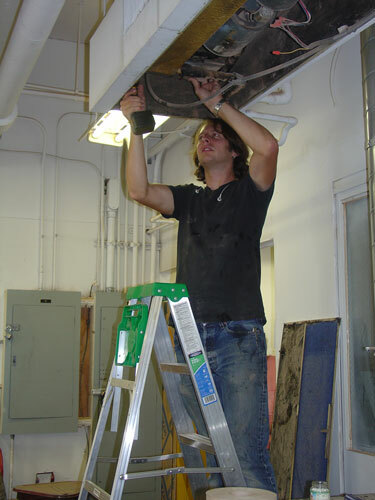 Peter also pitched in to try to repair a dripping air-conditioning unit. Then we talked him into doing another master class in cement casting. He added cable segments and glitter (are you paying attention, Hilary?) to this sample. 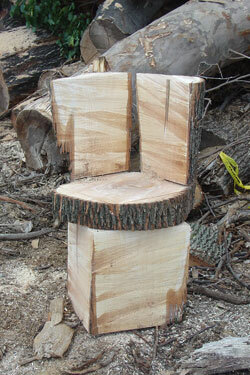 Jane used a piece of chainsawn honey locust to cast another sample. Siegfried added a wave/whale’s tail. I tried my hand at forming a freehand bowl over a pile of shavings. 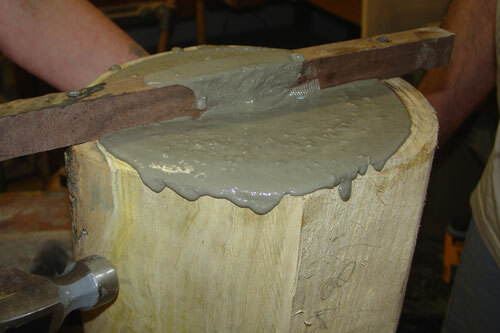 After removing the first sample from the form, Peter used water and a wire brush to expose the cable before the cement had finished setting. 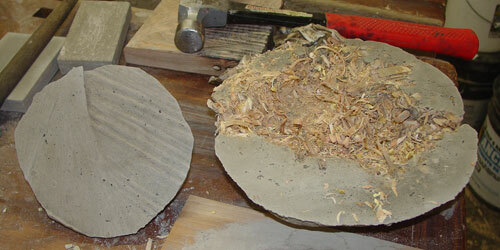 On the left, you can see the cast chainsawn texture from the second sample. 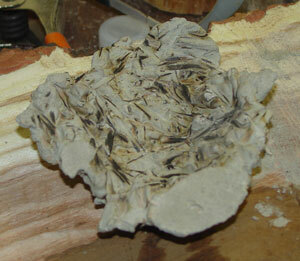 I will burn out the shavings from my sample after the cement has set overnight. I didn’t achieve much of a bowl shape, but it did give me a feel for the process for a more serious attempt. 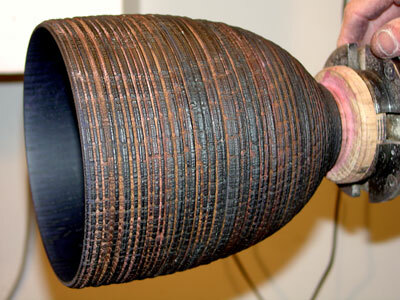 Jean-François’s third vessel will be a hollow form. 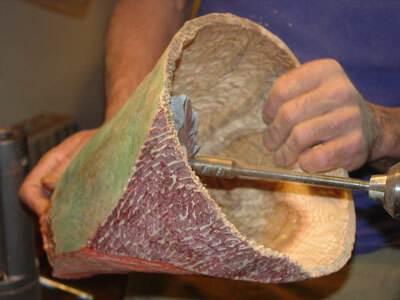 To cast the interior, he turned a form from a two-inch block of Styrofoam. He then suspended the form from a stick using double-stick tape . 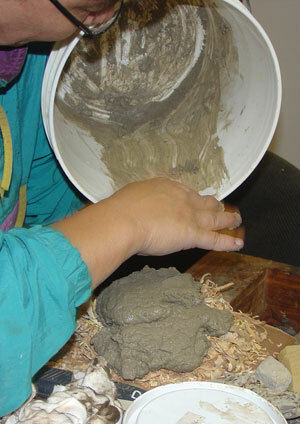 . .
and mixed and poured the cement. This mix is gray, in between the white and black of the first two bowls. Tomorrow, he will use acetone or lacquer thinner to dissolve the Styrofoam form, leaving a void in its place. Yesterday and today were big days for Jean-François. Here is what I found on Jean-François’s workbench this morning. He has had the idea for cement bowls in his mind for five years now. Beginning yesterday, he is seeing his vision fulfilled. 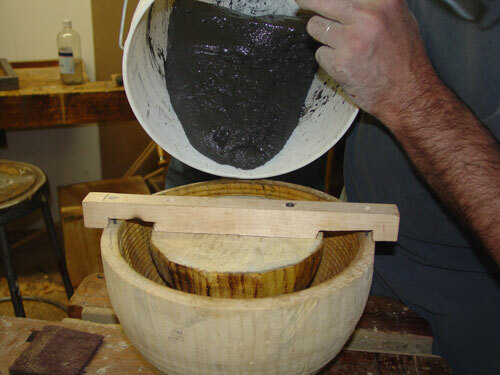 He proceeded to make a second bowl after a trip to Home Depot for some black cement color. 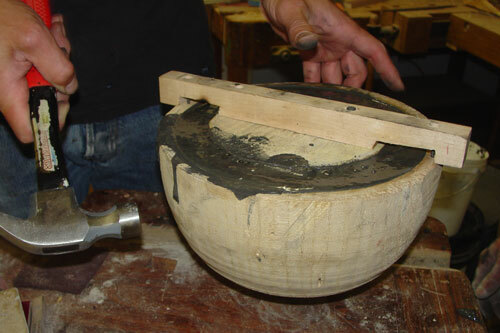 He used the same mold as for the first one, but he altered it by turning and carving some decoration into the forms for this bowl. 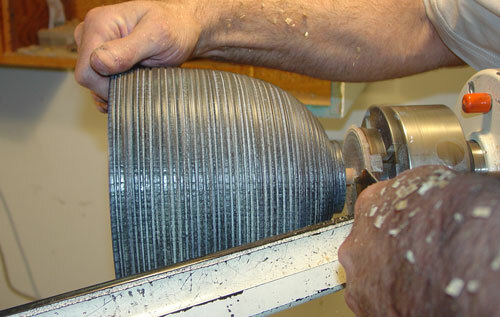 You can see the horizontal grooves in the outer form, which will become beads on the cement bowl. 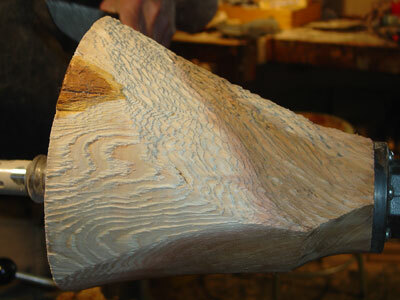 You can also see some carved facets on the inner form. 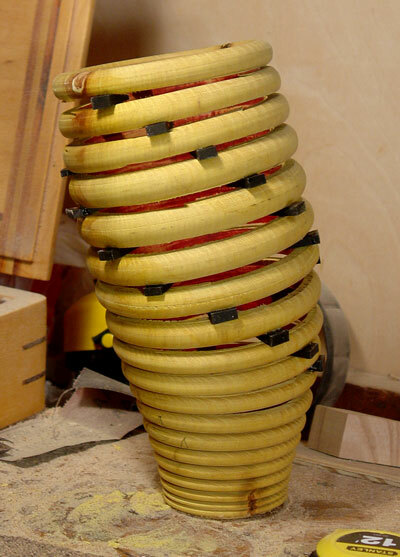 The inner form is suspended and held in place by screws in the top crosspiece of wood. 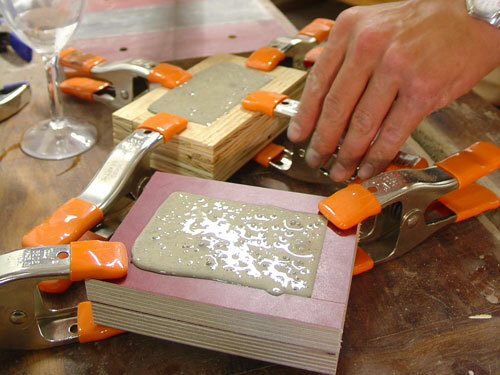 Oil has been applied to the wood surfaces to aid in releasing the set cement. Peter helped him with the whole process. Here, Peter is tapping the outer form to release bubbles from the cement. This doesn’t get rid of all of them, but it reduces their number and perhaps their size. Then it was a matter of waiting. 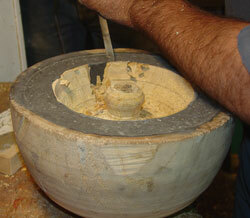 Finally, after six or so hours, Jean-François and Peter began trying to release the bowl from the mold. Tapping didn’t work, though it had for the first bowl. 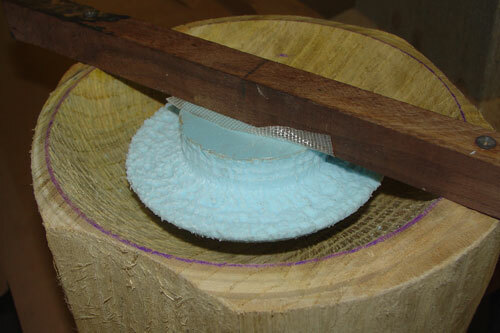 The texturing of the wood for this second bowl made the release more difficult. 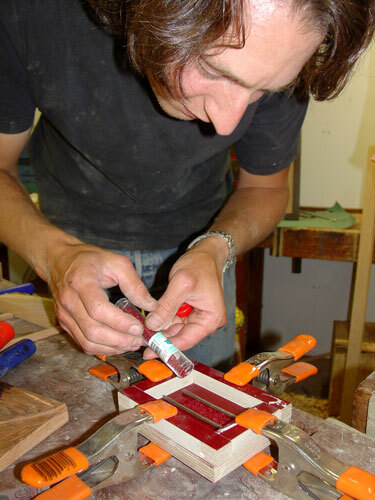 Jean-François ended up turning the assemblage (this was easy to do, because the outer form was still mounted on a faceplate), first cutting away most of the inner form, then carefully chiseling the remainder loose. Finally, the remaining form came loose and lifted out. You can see the grain impressions left by the wood, as well as bubbles that didn’t get released. 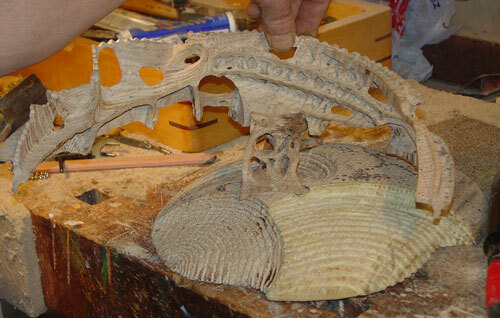 In the background is the inner form that was removed. 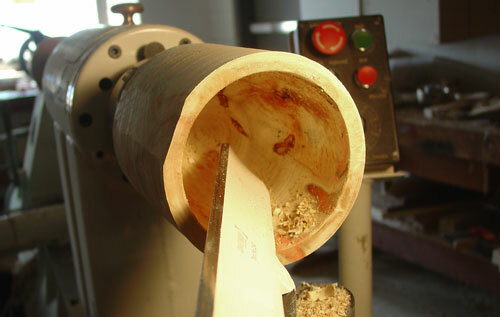 Jean-François also thinned the outer form on the lathe. He and Peter then split what was left of the outer form and peeled it from the cement. Jean-François will give what remains of the forms to Sean to use. The pair of bowls. 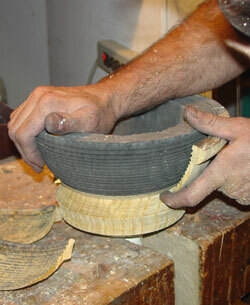 Jean-François will make a third cement bowl tomorrow. What Jean-François worked on while he waited for the cement to set was this oak bowl and another, to go with the red-and-black one from yesterday. He painted the second one with white acrylic and burned it to blacken the ridges. When Peter wasn’t working with Jean-François yesterday and today, he was working on wall pieces using blocks of the wood he is using in his bench—which is not cherry but honey locust, everyone agrees—and cable he brought with him from home. This is an experiment by Peter and Jean-François from yesterday. 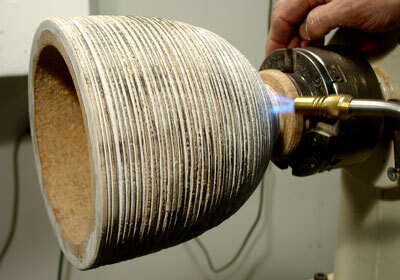 They formed cement over a pile of chainsaw shavings and then burned the shavings out with a torch. 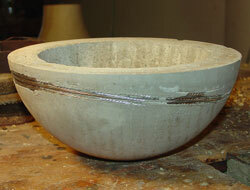 I love the texture and the idea of a freeform cement bowl. 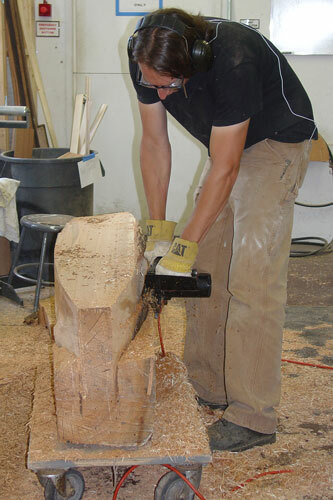 Working in his own corner, Sean did more carving on the components for his oak sculpture. 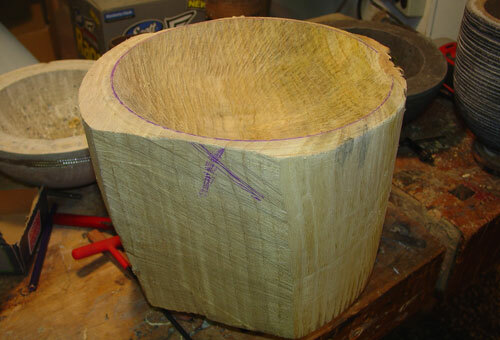 He also worked on turning a deep bowl of osage orange. 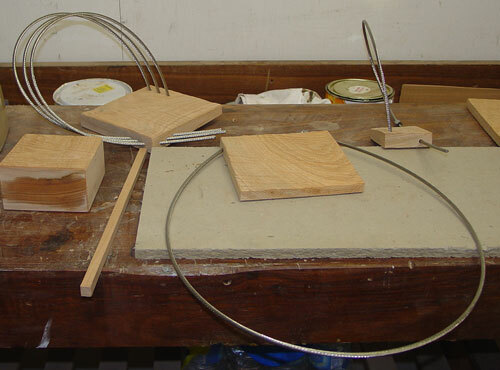 Siegfried continued making wave forms for a collaborative piece. As for me, after watching the cement pouring by Jean-François and Peter, and servicing the electric chainsaw with Jane and help from Sean, I started a vessel from an unknown wood with a large split down the side. Tomorrow, Jean-François is going to teach me some texturing techniques with the Arbortech, which I plan to use on this new piece. 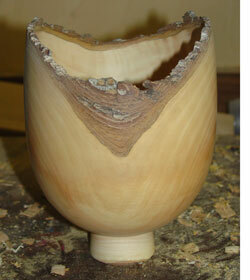 I also did more carving on the lip of the pear hollow vessel. 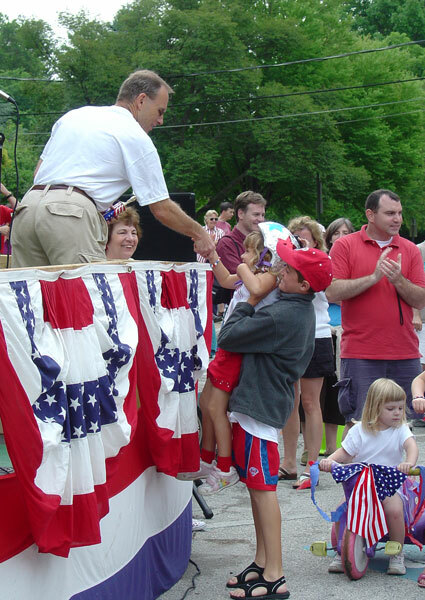 Today, Siegfried and I accepted Jane’s invitation to visit Swarthmore, PA, to see how one small town celebrates Independence Day. It was an experience as new to me as it was to Siegfried. We had a delightful time. We arrived in time for the pet portion of the parade. 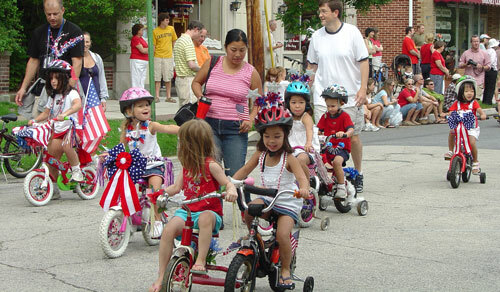 Next came the small bikes and trikes. 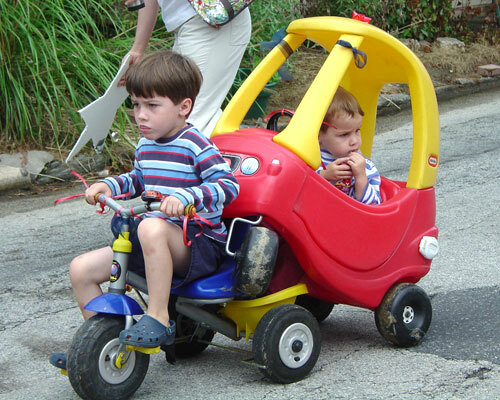 I particularly liked this variation on the tricycle. The winner of the small bikes and trikes division accepted congratulations and her award from the announcer. 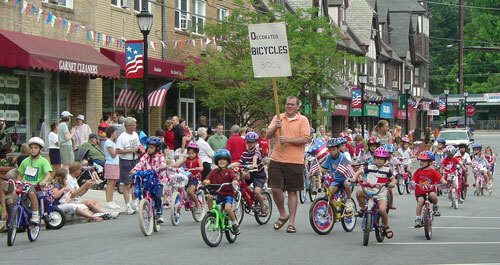 The larger decorated bicycles followed. 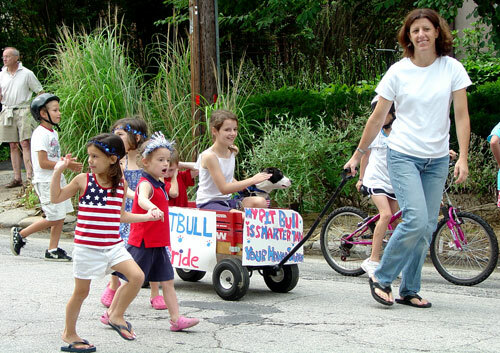 The floats waited in the wings while the bicyclists proceeded. 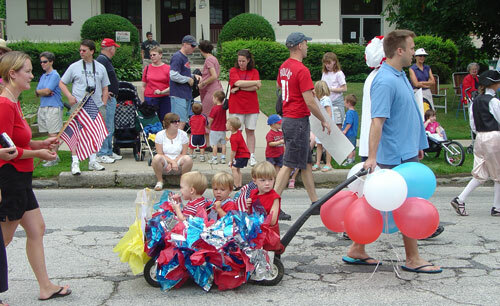 The pioneers in front won the float competition. 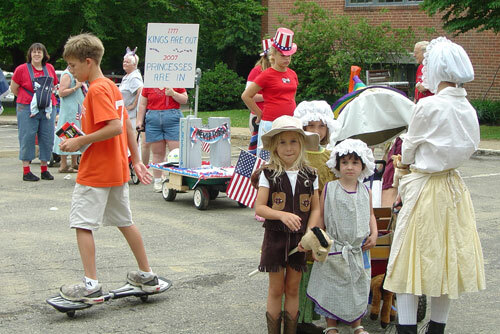 Unfortunately, you can’t quite see here the covered wagon (led by a stuffed horse) that they were pulling. Another float headed back down the parade route after the judging. 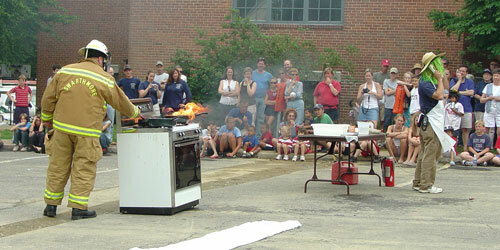 The highlight of the celebration was the demonstration by the volunteer fire fighters. There was a slight delay when the flare to be used to light the fire couldn’t be lit (is it a bad thing when firefighters have trouble starting a fire? ), but once it was, the drama began. First, a fire started on the stove behind the distracted cook, who was busy talking on the phone instead of tending the stove. 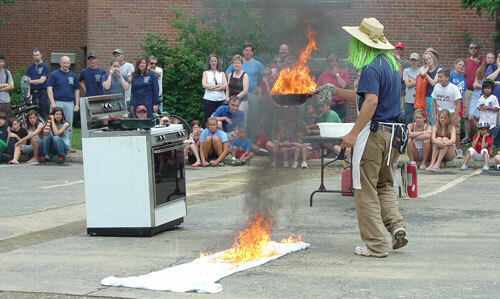 We saw how fire can spread if you try to run outside with a burning pan full of grease. The fire truck arrived, sirens screaming. 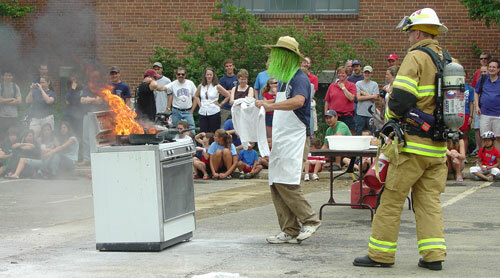 A firefighter stepped in to douse the fire using an extinguisher. Unfortunately, the fire wouldn’t go out. 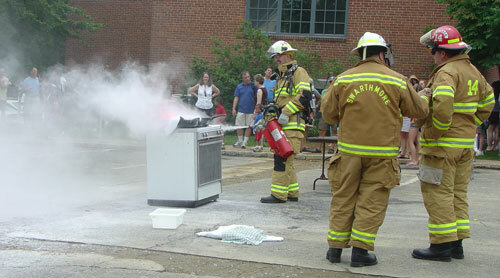 After several more attempts, the fire was finally put out. 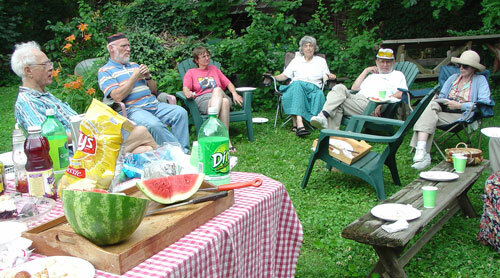 After this dramatic demonstration, we headed to the home of friends for an all-American cookout with grilled hamburgers and hotdogs, watermelon, and a delicious blueberry-and-rhubarb pie. A big thanks to Jane and our hosts for sharing this experience with us. It was a fairly quiet day at the shop after our big day yesterday. 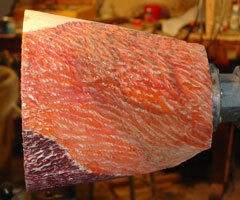 Jean-François turned another oak bowl with some interesting coloring: a base of red dye augmented with acrylic and other elements, and black over that with vinegar, then wax. 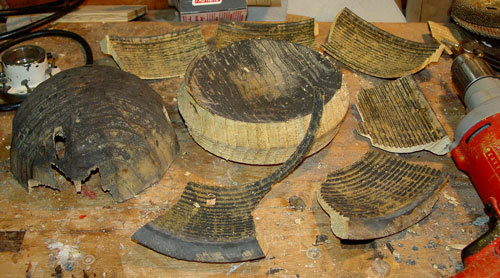 He also started turning bowls of ailanthus that he will use to cast a cement bowl. I can’t wait to see how this goes. Sean continued work on his Cryptomeria bowl. 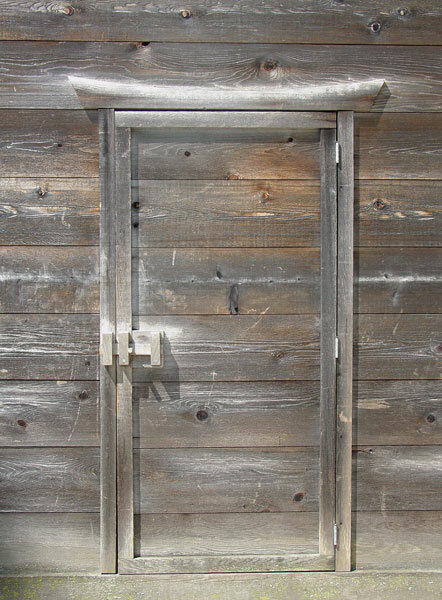 After painting and dying the textured exterior, he further hollowed and carved the interior, then sanded it. Siegfried worked on a large project on which he would like all of us to collaborate, involving turned wave forms combined into a larger wave. Here, he plays with some of the forms before planning his next move. He later consulted with Peter about the project. Peter went about making a frame for a wall piece using some of his used concrete forms. 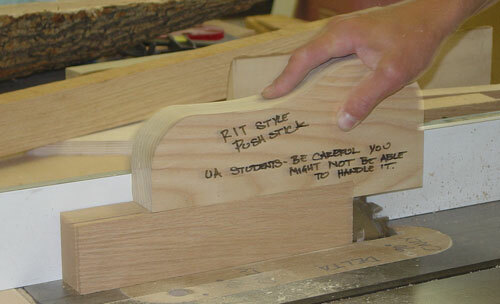 In the course of using the table saw, he found the shop’s push stick inadequate, so he made his own in the style of his alma mater, RIT (Rochester Institute of Technology). The photo above illustrates the magic of masking tape. I have the bowl reversed on a domed block with a foam pad in between. 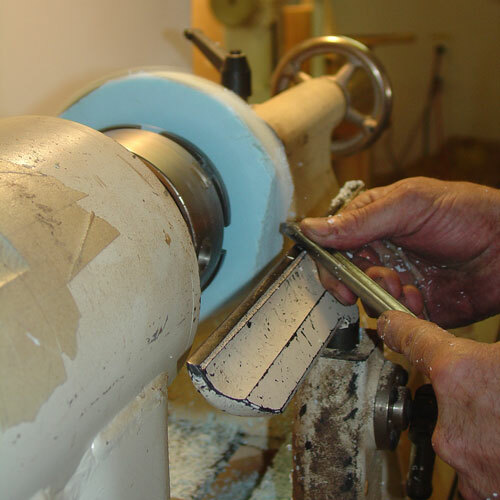 I used the tailstock to position the bowl and kept it in place to turn as much of the foot as possible. 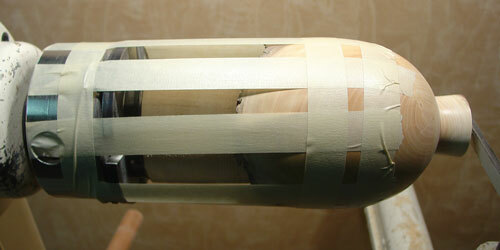 But to remove the interior of the foot, I had to move the tailstock. The masking tape miraculously holds if you tape the piece well and make only light cuts. 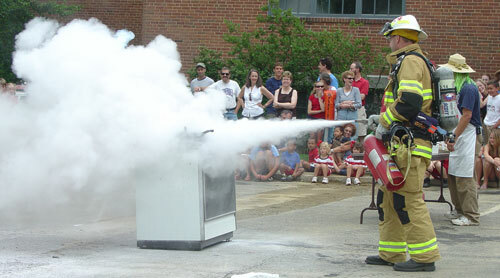 If you try this at home, be prepared to react quickly if anything starts to move. And don’t blame me if you choose to take the risk and you get a catch. A play day! 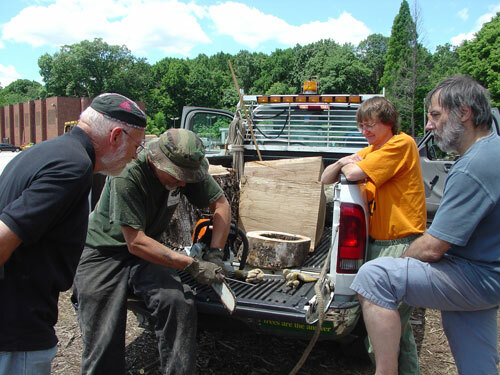 Gus, Jane, Jean-François, Siegfried, and I took Peter to the wood dump, and we loaded up again. I confess I went overboard, but, hey, someone will use the wood, right? 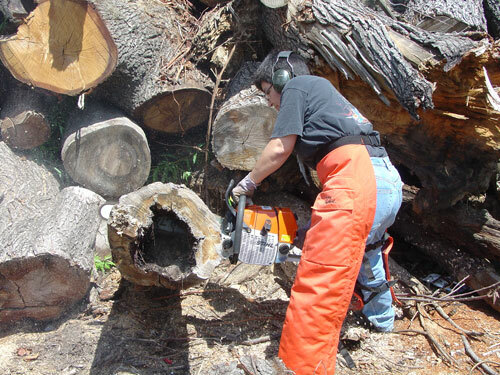 Here is Gus, master chainsaw artist, at work. 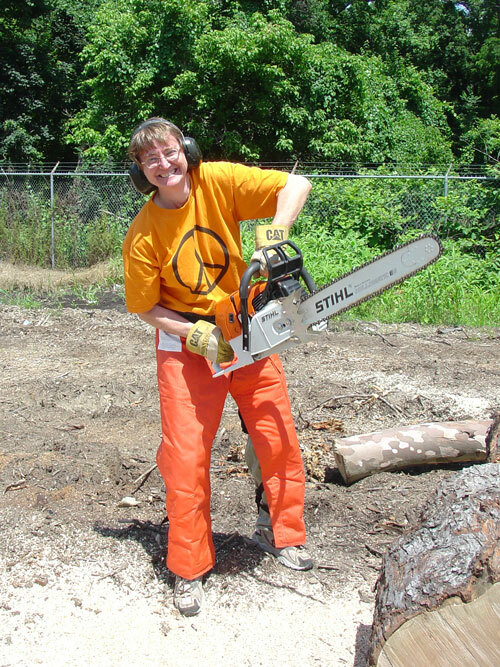 Peter proved himself pretty adept with a chainsaw himself. 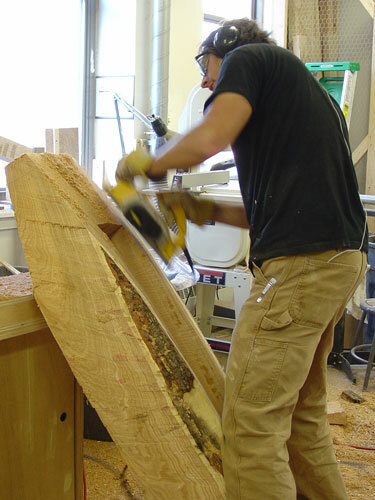 Here, he is cutting a large cherry log for a bench he wants to make while he’s here. 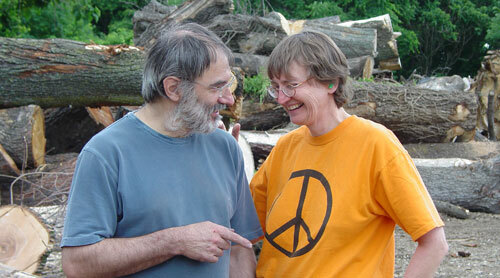 He also taught Jane and me how to use the chainsaw safely. We cut so much we had to stop to sharpen. Gus showed us all how to sharpen the chain properly with a round file. Peter, our resident furniture maker, cut a cube from a log segment and stacked the remainder of the log on the cube. Voilà! His first ITE chair. 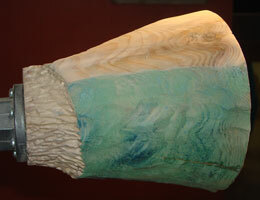 It won’t make the exhibition, however, since it came apart when he tossed what was left of the log on the pile. 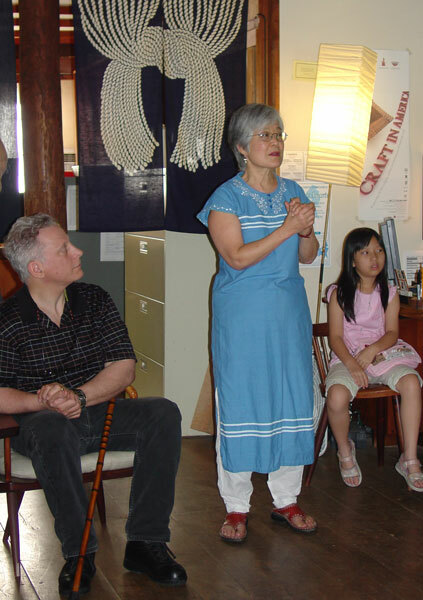 Communicating across languages is no problem for Jean-François and Jane. In fact, the English language skills of both Jean-François and Siegfried have improved significantly since the beginning. Meanwhile, none of the rest of us has improved in the least our French or German. Peter has been trying out his high school (or was it junior high?) French. Jean-François laughs. 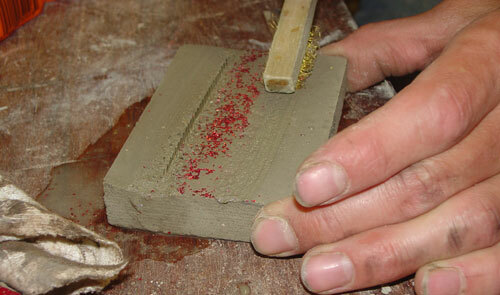 Back at the shop, Peter, Jean-François, and I experimented with quick-setting cement that Peter brought with him. The possibilities are interesting. 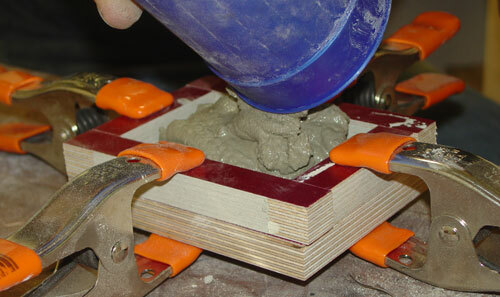 Peter couldn’t wait for the cement to dry before taking apart the form. Jean-François thought perhaps he should wait. Jean-François (whom Peter had earlier accused of stealing his pencil) awarded Peter a pencil for a good demonstration of his use of cement, then took it back when Peter’s first sample came apart because Peter had removed it from the form before it had set. Peter later earned the pencil back with a successful second sample. Now, he has two pencils: his own and the one from Jean-François. 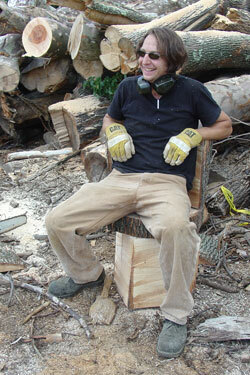 Peter roughed out the shape for his bench in the shop with an electric chainsaw. The log is finally light enough for him to be able to stand it up by himself. 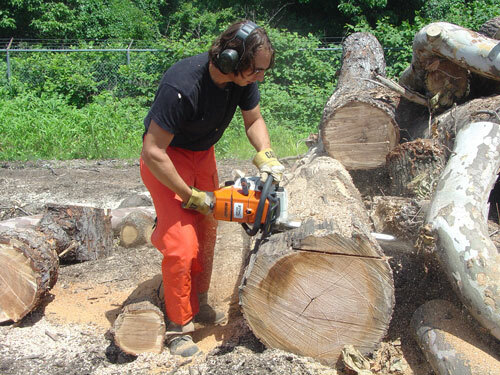 Now he is using a power planer to further shape the wood. Turning actually went on in the shop today too. 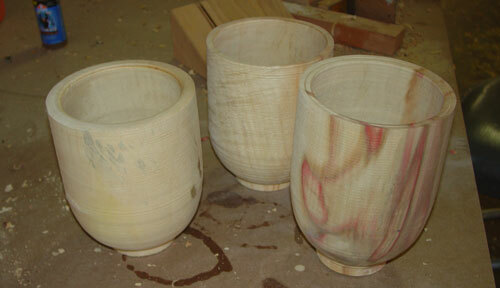 Sean has turned a bowl of Cryptomeria on three or four centers and is texturing each face differently. 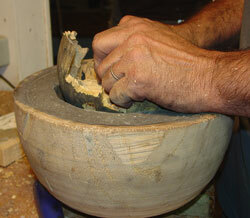 I started a new pear bowl, and Jean-François turned another oak bowl. Yesterday evening, Broad Street (a.k.a. Avenue of the Arts) closed just a few blocks up from us for a small jazz festival with Branford Marsalis, part of Philadelphia’s celebration of the Fourth of July. I strolled up and swayed to the music for a bit, but was so exhausted from hauling logs that I couldn’t stay. Home to blog for me!